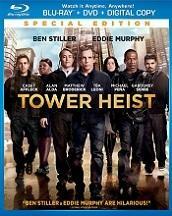 With 'Tower Heist' now available on Blu-ray, Universal has just released a collection of clips from the film, some previews of the Blu-ray's special features, and interviews with the cast and filmmakers. This comedic ensemble heist movie tells the story of a group of defrauded working class folks plotting to break into the penthouse apartment of the Ponzi scheme's mastermind in order to retrieve some of the money that they've invested. With Eddie Murphy making a triumphant return to comedy, he brings the best out of his co-star Ben Stiller, Casey Affleck, Matthew Broderick, Michael Peña, and Téa Leoni. Check out the following clips to see some of the Blu-ray's extensive special features. For the film's wild car sequences, they didn't want fiddle with an expensive classic Ferrari, so designers converted a Volvo P1800 into Steve McQueen's iconic cherry red Ferrari 250 GT Lusso. Eddie Murphy discusses his triumphant and hilarious return to comedy. Peña talks about his not-too-bright character. The origins of the script. Ratner's enthusiasm is explained and exemplified via on-set clips. Broderick explains his character and how he really has no reason to participate in the heist. A breakdown of Affleck's sarcastic character. Ratner praises Gabourey Sibide for her comedic timing. Murphy requires the inexperienced robbers to steal $50 worth of merchandise in a mall. The crew gets a surprise. As currently seen on television.